Can You Install Apps on the Apple TV? The Apple TV is a terrific device for streaming TV, movies, and music from the internet to your TV. It even comes with a bunch of pre-installed apps that make it easy for you to start enjoying the device right away. But what if you want to add additional features or functionality to your Apple TV? What happens if a streaming video service you love isn't pre-installed on the Apple TV or you want to play a game? Does the Apple TV work like an iPhone and let you install apps from the App Store? The answer is: it depends on which model you have. If you have the 4th generation Apple TV, which Apple introduced in Sept. 2015, or the the Apple TV 4K, aka the 5th generation model, that debuted in Sept. 2017, the answer to whether you can install apps is yes. Those versions of the Apple TV are built around the idea that, as Tim Cook said when introducing the 4th gen. model, apps are the future of television. Installing apps on the 4th or 5th gen. Apple TV is similar to, and just as easy as, installing them on an iPhone or iPad. The operating system that runs on the Apple TV, called tvOS, is slightly different from iOS, so the steps for installing apps on it are slightly different, too. For a step-by-step tutorial, check out How to Install Apps on the Apple TV. Just like on the iPhone and iPad, you can redownload apps on the Apple TV, too. Go to the App Store app on your Apple TV, select the Purchased menu, and then select Not on This Apple TV for a list of apps available for redownload. Buy a 4th Generation Apple TV from BestBuy.com. Unlike with the newer models, users cannot add their own apps to the 3rd, 2nd, or 1st generation Apple TV models (except in one case, as we'll see). That's because the 3rd generation Apple TV and earlier models don't have an App Store for third-party apps. But that doesn't mean that new apps don't get added. Buy a 3rd Generation Apple TV from BestBuy.com. While users can't add their own apps to these Apple TV models, Apple added them from time to time. When the Apple TV debuted, it had less than a dozen channels of Internet content. By the time Apple stopped making these models, there were dozens. Apple no longer supports the 1st, 2nd, or 3rd Generation Apple TV, so new channels are no longer being added to those models. 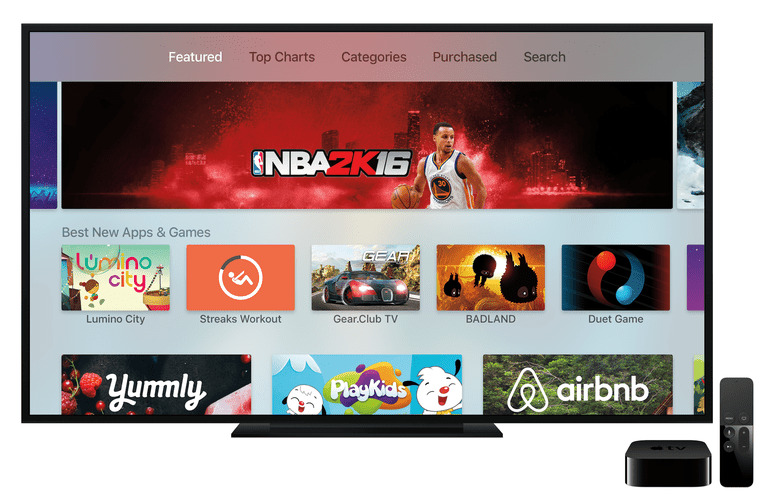 For the latest apps and most options, upgrade to one of the new Apple TV models. There was generally no warning when new channels appeared, and users couldn't control if they were installed or not. When you turned your Apple TV on, you'd find that a new icon had appeared on the home screen and that you now had new content available. For example, the WWE Network wrestling streaming service simply appeared on Apple TV screens with no advance warning when it launched in Feb. 2014. Sometimes Apple bundled new apps in with updates to the Apple TV's software, but new channels often debuted as they were ready. Not everyone is content with the idea that Apple controls what's on their Apple TV. Those people often turn to jailbreaking. Jailbreaking allows users to modify the Appel TV's operating system to remove Apple's restrictions and allow them to make their own changes — including installing software. Jailbreaking can be a complex process that requires some technical understanding to accomplish. It can also cause problems with the device you're trying to modify, sometimes even leaving it unusable. So, if you're considering jailbreaking your Apple TV, make sure you have the right skills for the job (don't say you weren't warned!). When that's done, you can install new tools like Plex or XMBC, which give you access to streaming content that Apple doesn't. You won't be able to install any app you want — you can only use the ones that are compatible with the Apple TV — but some is better than none. In order to jailbreak an Apple TV, the jailbreaking community needs to have released software for the version of tvOS that you're running. Not every version of tvOS can be jailbroken. A good rule of thumb is that the older the version, the more likely a jailbreak is to be available.